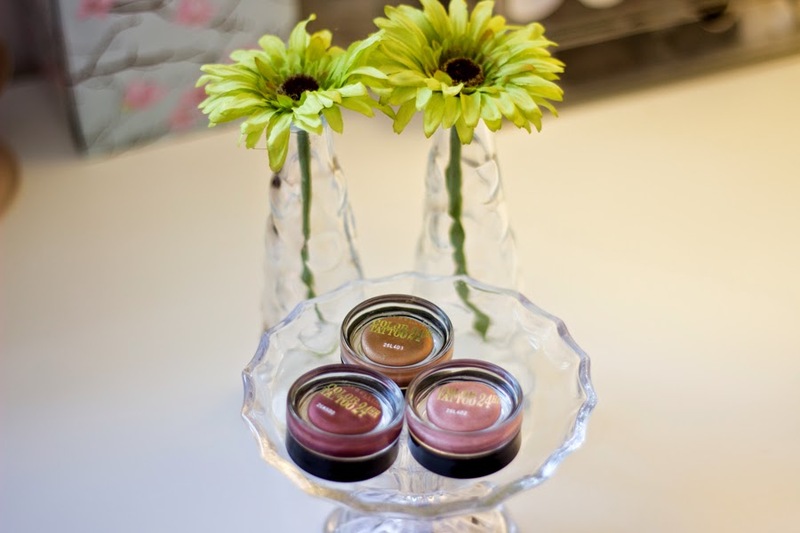 My love for eyeshadows have been heightened this year because I started experimenting more. I used to be the girl who skipped eyeshadow because I was late to work and I really could not be bothered with it. However, all that has been changed and I am now a huge fan of eyeshadows in fact, they are my favourite part of my makeup application. 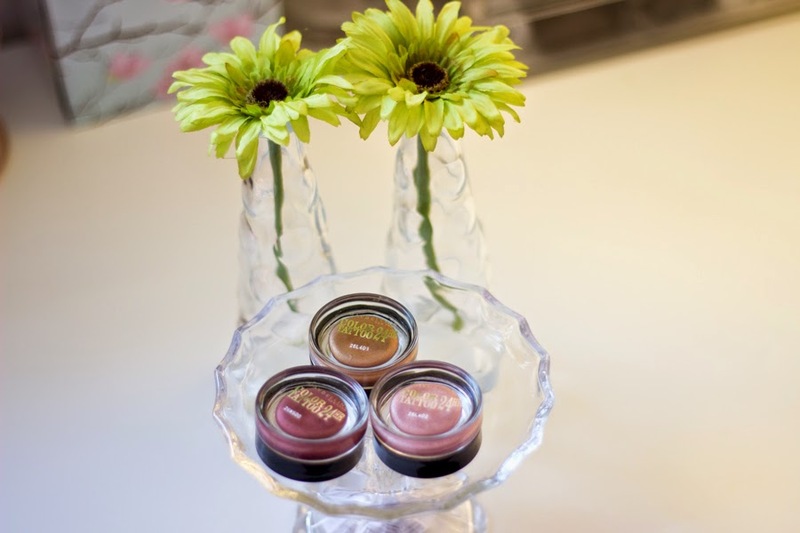 I have tried many drug store eyeshadows as well as high end ones and I love them all. I recently purchased the Maybelline 24H Colour Tattoos and I am smitten with them :-). 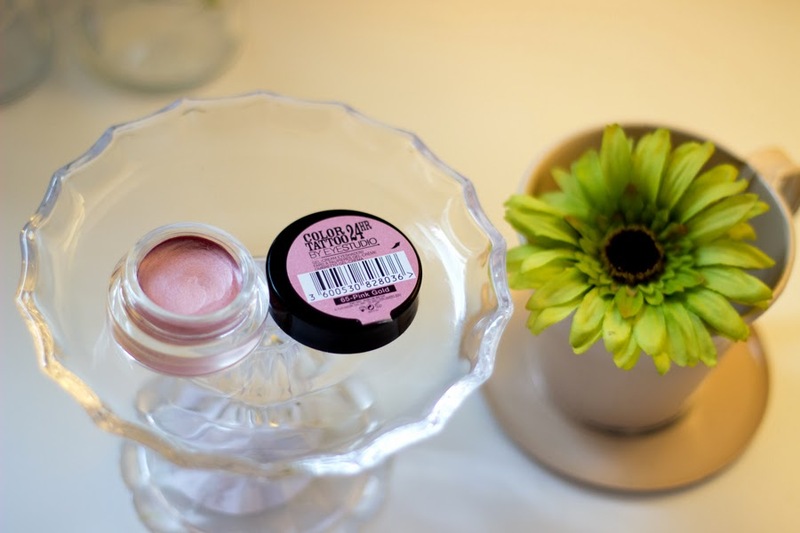 I already tried the L'Oreal Infallible Colours which I really like and I have reviewed here but they are much different to the Maybelline offering. The L'Oreal version is more of a pressed pigment which has tiny shimmer particles while the Maybelline version is more like a pasty/gel texture and I really like both versions. As expected from individual eyeshadow/pigments, they come in small glass tubs which I quite like; not sure why but I just do. They have really nice lids as well which screw tightly so no accidents happen. I don't think there is much to say about the packaging. 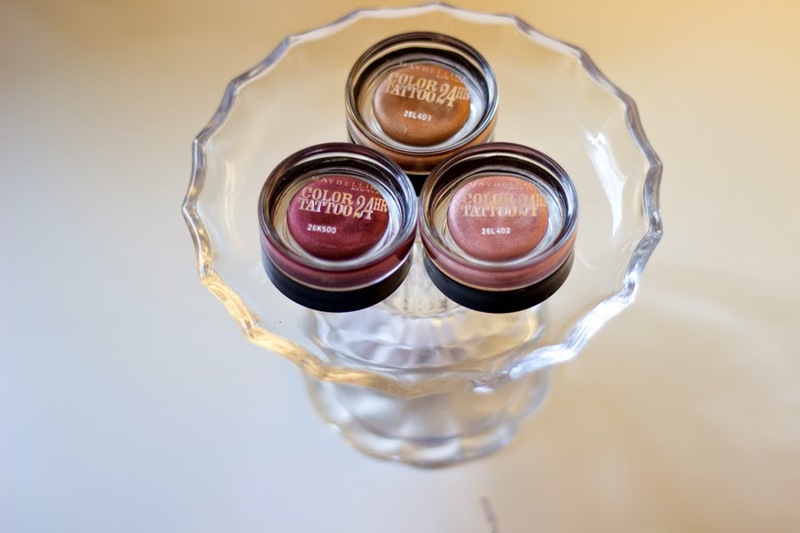 It's a basic transparent tub which means you can see what colour/shade of eye shadow you are after and it has a nice label which attempts to match the colour of the eyeshadow. Most of all, it just looks lovely when it is displayed..don't blame me; it's the blogger in me that's obsessed with pretty packaging. As mentioned earlier, they have a gel-like pasty texture which applies on the eyelid like an eyeshadow base (think: MAC Paint Pots). I have not had any issues with the formula although I feel if you have oily eyelids, you may want to prime your eyelids before application to prevent any slippery/slidey mess from happening. I can't really classify my eyelids as oily but then again, I always use a primer so I am not sure what their true nature may be. I really like the formula because it is very long lasting and once sets, it's going nowhere so they were really not messing about when they named these Colour Tattoos. I apply this with my fingers or an eyeshadow shading brush (I love my Lancome one). 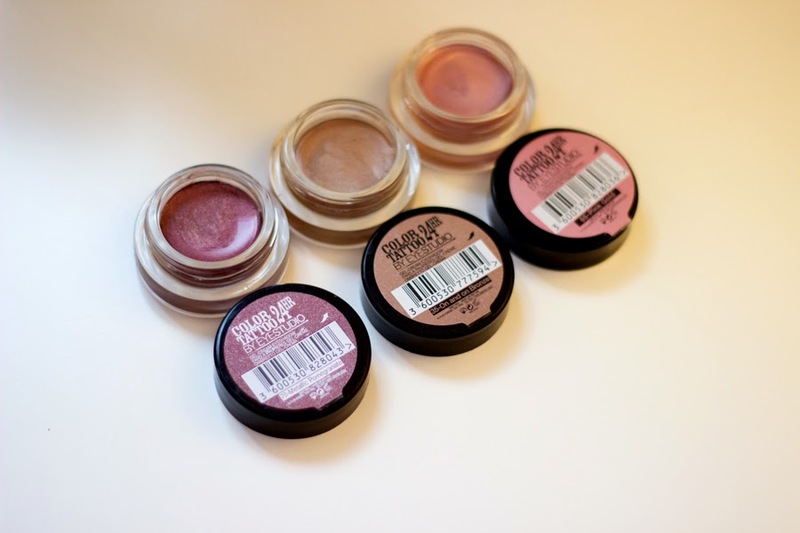 It applies really well as mentioned before and they are no fall outs because it is not a pressed pigment which is really good. I have worn this on its own and under some eyeshadows and the results are always outstanding. To be fair, I have worn it more under eyeshadows than on its own. In terms of pigmentation, I find that they apply somewhat differently to my skin than what it looks like in the tub and that may be as a result of my darker skin tone which is understandable. I mean, I don't mind at all but I thought it was worth mentioning. However, I am pleased with the shade that shows up on my lids and how long lasting they are. They really won't budge and you need to remove this with an eye makeup remover. So you can be rest assured that your eye makeup will remain intact. I also have a feeling they are waterproof but don't quote me on that as I am not 100% sure but they appear to be because they last so long on my eyelids. Boots were having a 3 for 2 offer so I could not resist as usual. 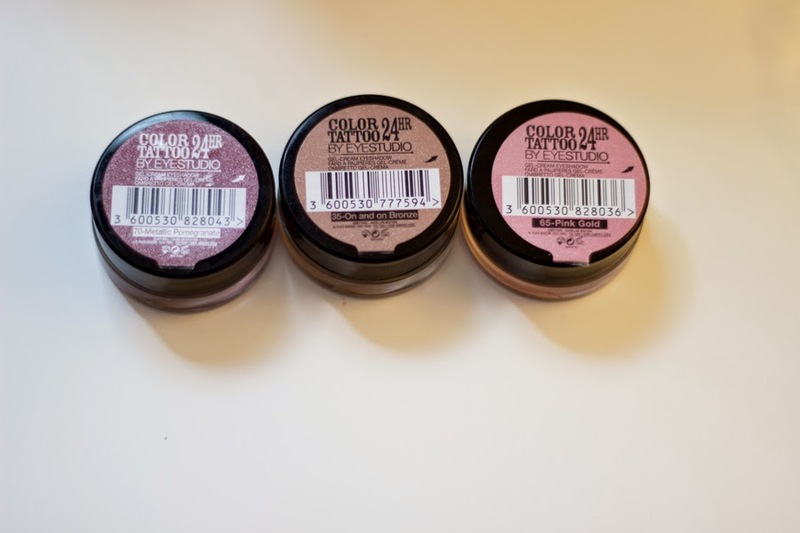 I picked up three shades I thought I could get the most use out of because it does not make sense buying colours that look pretty but you won't get much use out of. I chose Metallic Pomegranate, Pink Gold and On-and-On Bronze and I absolutely love all my selections so much so that I am thinking of going back to pick more only if the offer is on because they are not exactly the cheapest colour tattoos out there. 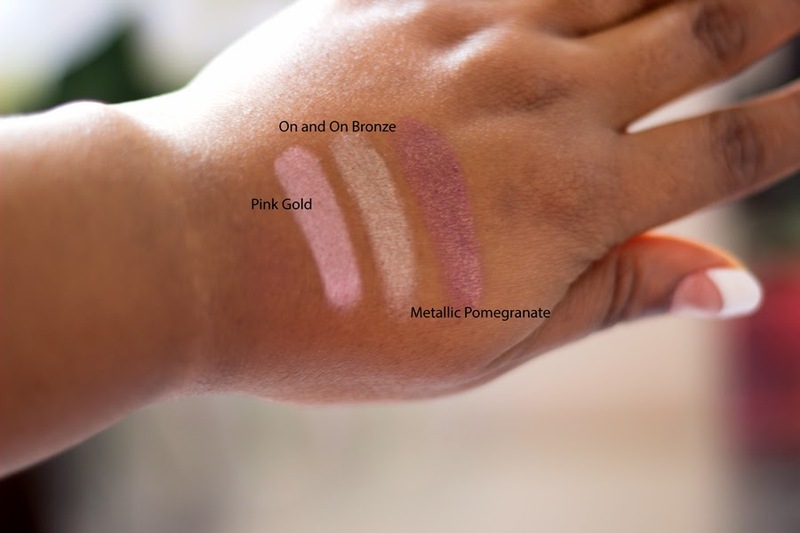 Pink Gold: As the name implies, it is a soft pinkish gold shade which looks really soft and flattering especially if you want a nice neutral makeup with a tiny hint of colour. To be fair, this is one of the shades that don't appear the same way as it looks in the tub on my eyelids but that's okay. On my eyelids, they appear a little pale or not very pigmented but I like how it looks which is perfect for days when I can't be bothered with makeup. But when I add another eyeshadow (preferable a pale pink one), it's like POW!! 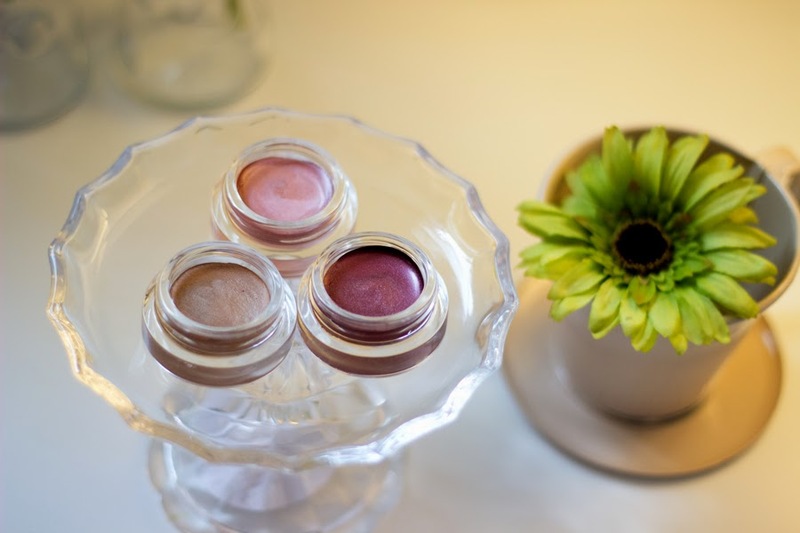 It's amazing how it transforms a simple eyeshadow or even eyeshadows that have little or no pigmentation and I guess that's what makes it really special. 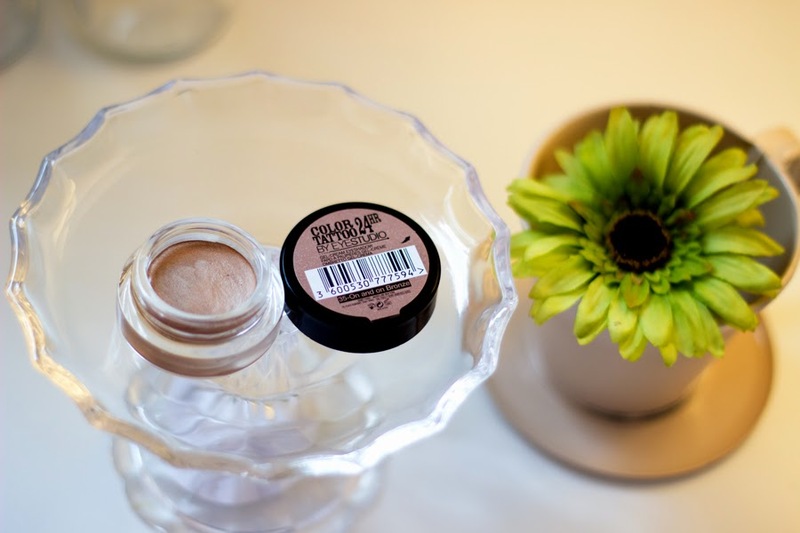 On-and-On Bronze: I think this may be the most popular shade here in the UK and US. I think it's called Bad to the Bronze (in the US) and it's a bronze metallic shade which has amazing pigmentation and it's one of the shades that appear true to colour both in the pot and on my eyelids. I totally love it and I wear it on its own most times or when I feel adventurous, I add MAC Amber Lights on top and the results are really outstanding; I love it. This shade flatters many skin tones and I guess that's why it is the most popular shade from the range. 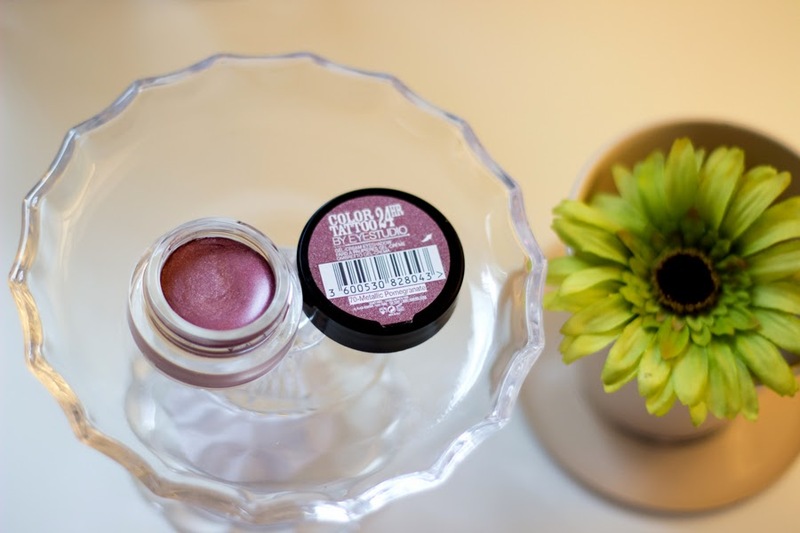 Metallic Pomegranate: I was drawn to this because I knew it would be perfect for Fall and I just like these sort of rich deep colours as you may know. It's a rich dark red shade with subtle hints of purple and it is just similar to the colour of a pomegranate if you will. It has some shimmer in it which may not seem so noticeable in the tub but when it goes on your lids, it's quite evident but I don't mind. I am not sure if it's me but it appears quite dark on my lids which I was quite surprised about. It's another one where I layer a brighter eyeshadow on top because I am not really a fan of dark eyeshadows especially during the day. I have used this with MAC Cranberry and Antique and the finish is really lovely. I can see this being perfect for nights out when smoky eyes are the order of the day. It retails for £4.99 per tub which sis fair i guess because I don't really see this finishing any time soon so you would definitely get good value. I have to say I actually prefer this to the L'Oreal Infallible Colours (don't shoot me) because I prefer the texture and I dare say it lasts longer than the L'Oreal version although both of the are really good. 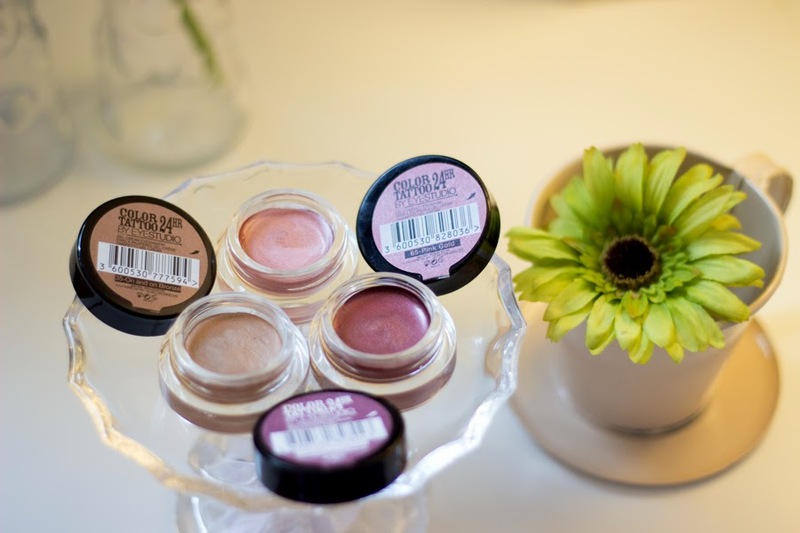 As always, if you are on a budget, always wait till there are offers and 90% of the time, Superdrug, Boots and other retail stores always have offers on Maybelline products. I love them and I am definitely picking up more shades. I noticed that some new shades have been recently introduced in Superdrug so I would update this when I know what their names are. Sometimes, you get some products and you never get much use from them but that's not the case with these babies because they are brilliant. 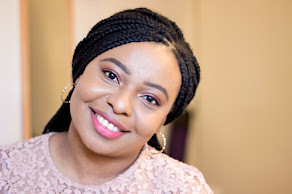 If you are on a very strict budget, I would recommend picking up the On-and-On Bronze (Bad to the Bronze) because it is an all rounder and would definitely suit many skin tones and mostly, you can create various looks with it. See you in my next post..TGIF, baby! I really love your blog! 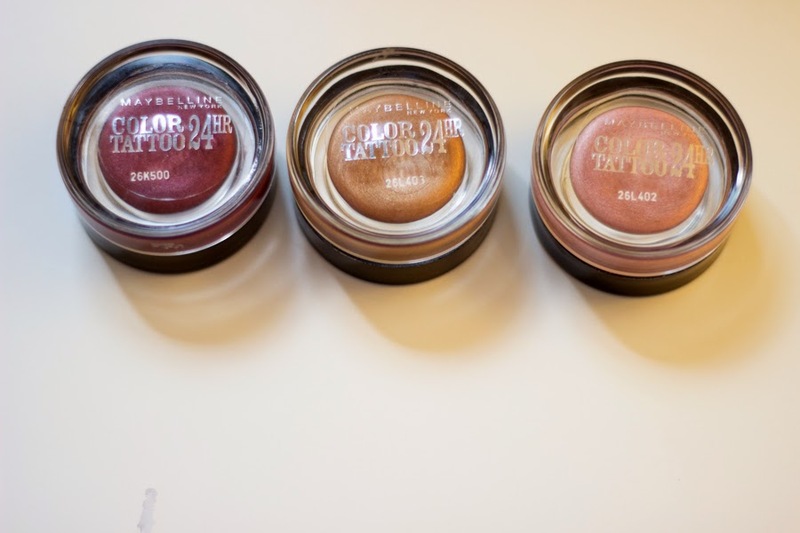 The Maybelline Color Tattoos are just brilliant - I recently got the one in Rich Mahogany from the US and is is beautiful. I got it via ebay and it was in perfect condition even though I was a little concerned it might not turn up but it did and I couldn't be happier with the shade. I love the maybelline tattoos and your photos are lovely. Swatches would've been awesome. Awww thanks a lot!! You would definitely love the Pink Gold shade because it is very flattering! !